This morning former congressman Ed Foreman released a devastating dossier on the facts behind the jail sentence of popular TV personality and whistleblower, Kevin Trudeau. Below is the 1st of 5 documents with the facts. Sadly, the story you are about to read is true. This is a story that is so incredible, that it is almost impossible to believe. A story of how the American legal system, on hopefully only rare occasions, can completely run off the rails. It is a story that started with an absurd Federal Trade Commission (“FTC”) administrative action against a #1 New York Times bestselling author. The subject of the action was the author’s public expression of his opinions about one of his books. At first, the “complaint” resulted in “no finding of admission or wrongdoing”, which should have been the end of the story. But when a defiant and combative free speech advocate collides with two equally defiant, yet infinitely more powerful federal judges, the benign case escalates into a retaliatory criminal contempt of court charge initiated by the presiding judge himself. The tragedy finally ends with my friend getting locked up in a federal prison, where he is currently serving the longest prison sentence ever imposed for the “non-crime” of contempt of court: an unthinkable, draconian, ten years of imprisonment. All over a NY Times bestselling book and the exercise of free speech. My friend Kevin Trudeau has now spent four long years inside a federal prison. Everyone agrees that Mr. Trudeau is not guilty of breaking any federal laws. Contempt of court is not a felony and is not even classified as a misdemeanor. Mr. Trudeau’s incarceration is an unprecedented application of “contempt of court”. He has now exhausted all the appeal remedies available to him. Each has been inexplicably denied. An injustice even as grotesque as this can prevail, in part, because of an overburdened, and what appears to be at times, a politically motivated appeals process. Trudeau has appealed his conviction for contempt of court as well as the egregious ten year sentence all the way to the Supreme Court. However, every year there are more than 12,000 cases presented to the Court, of which it accepts only 60-70 for consideration. It goes without saying that any individual’s chances for redress are thin indeed. Mr. Trudeau’s case did not make the cut. At this point, Trudeau has only once chance for justice. To correct this folly of the judicial system, my friend’s only hope is that President Trump will grant his Official Petition for Commutation of Sentence. Mr. Trudeau has formally petitioned President Trump to commute (reduce) his ten year sentence to the four years that he has already served. I believe that commutation of Trudeau’s sentence is fully justified and is simply “the right thing to do”. I am seeking your help to make this a reality and correct the cruel and unusual punishment that Trudeau has been imposed on Trudeau. Kevin is a unique individual, which is perhaps the real source of his problem. He is a #1 NY Times bestselling author of six books, with more than thirty million copies sold. Those books include: “Natural Cures They Don’t Want You to Know About”; “The Weight Loss Cure”; “Debt Cures”; and “Mega Memory”. You or someone you know may have read one of Kevin’s books, listened to him on the radio, or watched him on television. Mr. Trudeau has been a daily mainstay on worldwide TV and radio since 1989. Kevin has been a long-time proponent of natural health care and free speech, as well as a “whistleblower” against Big Pharma and what he calls “the unholy alliance between Washington special interests, politicians, and bureaucrats”. Kevin is also a former radio host and a highly respected and successful self-made international businessman and entrepreneur, who has created thousands of jobs. He is well known for being an outspoken critic of government agencies such as the Federal Trade Commission, the Food and Drug Administration, as well as the pharmaceutical industry. Kevin has legions of satisfied customers and supporters. Ironically, he has always maintained a full money-back guarantee of satisfaction that has never been compromised. Kevin has relied on happy, satisfied, repeat customers for his unprecedented longevity and amazing success. I know Kevin to be a pleasant, thoughtful individual, who in the course of his entire life has always striven to make our society better. He is generous, upbeat, and trustworthy. But Kevin is also a fighter and a champion of the “little guy”. He is dedicated to empowering the powerless. He is a defiant, at times even arrogant, proponent of free speech and the importance of citizens speaking out about issues of consequence to the country. Kevin has also been extremely vocal in his criticism of activist judges, who he says ignore the law, and rule based on their own personal political beliefs. Kevin has probably not made many friends in certain circles by taking the federal regulatory process and the pharmaceutical industry head on. Over the span of his three-decade career, his strongly held views have been known to rub some people the wrong way. It is a well established fact that Kevin has been a mark on the “hit list” of the “Washington Political Establishment” for decades. Upsetting the apple cart and challenging the status quo have always been Kevin’s trademark. But isn’t this what democracy is all about? Doesn’t an effective democratic process require citizens to speak out for what they think is right? Are we not allowed to offer our opinions freely, without the fear of being dragged to court by our own government? Most believe that this defines the actual role of being a citizen. Unfortunately, this irresistible force (Trudeau), has met an immovable object (the FTC and two federal judges). Apparently, the very same characteristics that were lauded by the founders of our country can also be harshly rewarded by the judiciary. Admittedly, in Trudeau’s case tempers flared both in and outside the courtroom. “Stands” were taken on principle. Things were said and positions hardened. And yes, if the players on both sides could do it all over again, I am sure they would turn down the “volume” this time around. Trudeau has readily admitted that he would “do things very differently” if he had the chance. But should justice be a function of “volume”? Isn’t Trudeau’s incarceration in federal prison for ten years really a clear-cut case of judicial retaliation, exacted against him because he fully exercised his constitutional rights? Mr. Trudeau is not languishing in a federal prison because he broke a United States law, but rather because he had the audacity to be outspoken and express his anger about the way that he and a multitude of others have been treated by an unresponsive bureaucracy (the FTC and FDA) and an unaccountable arm of the government (the judiciary). 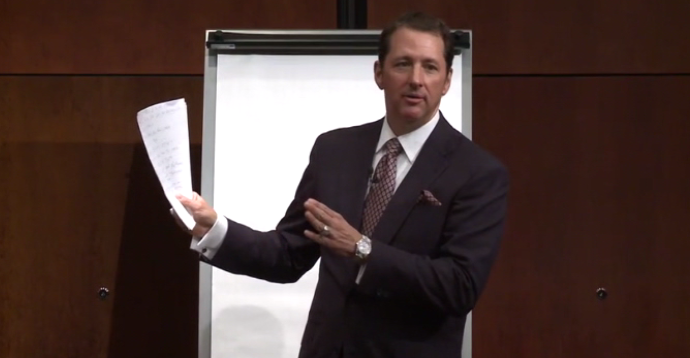 Kevin Trudeau needs your help. More importantly, “Justice” needs your help. 1) The facts and circumstances of Trudeau’s case presented in chronological order. It will shock you. It reads like a Hollywood script, but actually defies credulity. Who could believe that what happened to Trudeau in our courts is actually true? But, sadly, it is all true. 2) The Top 10 Reasons why President Trump should reduce this outrageous and cruel ten year prison sentence. Read this and you too will be 100% convinced that Trudeau’s sentence should be reduced. 3) Who is Kevin Trudeau? A short “bio” about Trudeau’s colorful history. 4) The “Hidden Motive” that proves Trudeau is innocent. This is the “smoking gun”, the “found evidence” that eliminates once and for all any lingering doubt about Trudeau’s innocence. Please review the enclosed materials. I believe you will be as horrified by what you read as Kevin and his attorneys were when they lived through it. I am available for questions and clarifications if needed. Please do not hesitate to contact me. If you are in position to do so, I ask that you encourage President Trump to grant Trudeau’s Petition for Commutation of Sentence and correct this terrible injustice. It is THE RIGHT THING TO DO. Kevin should not have to spend one more day in prison. Kevin maintains his complete innocence and is hopeful that President Trump will see the absurdity of a ten year prison sentence for the “non-crime” of contempt of court, and thus rectify the situation as only he can by commuting Kevin’s sentence.